I dont think I have ever been “Wowed” at a lube place. I was in and out in 10 min. They gave me a paper, coffee, and a jiffy lube toque to keep. I drive older car and was telling the guys that my car burns oil and they asked me if I would like to try Lucas (thinker additive that goes into the oil) I said no just put in the regular oil. The supervisor came over and said just try it, it will help with your burning oil, I asked him how much it will be? He said he will give me 20% off (it was $20 regular I think). The Supervisor went on to say how they dont sell things to their customers just for the sake of selling it. He said if you require it we will offer it to you and tell you the advantages and disadvantages.....you can make up your mind from there. (I was like heard this before).....I said okay add it to my oil. Right before I left they offered me a car wash retail $15 (best one wash world offers) for only $7.50. Needless to say I bought 1 (I’m a sucker for great deals!). They did my service and I left. One month later…….ALL I HAVE TO SAY IS WOW this product was amazing. Im really happy I listened to him. I havent burned any oil and I can feel my car running smoothly since this service! GREAT JOB GUYS AND THANKS….. SEE YOU IN ANOTHER 2 MONTHS. I promise all my family and friends will be coming to you! I have changed oil change shops since the beginning of the year and I come back to have my oil changed here approx every 2 months. My previous oil change shop was a no-frills place and they were cheaper than this Jiffy Lube location- but seeing as how I should care for my vehicle as much as possible, since I rely on it so much- I decided to make the change to Jiffy Lube (I first tried them based on their significant google review following). The staff are professional and dont try to be overly friendly or buddy-buddy. They are a clean, well maintained and operated franchise location (is my understanding) with a good core staff with who I assume is the owner-operator. 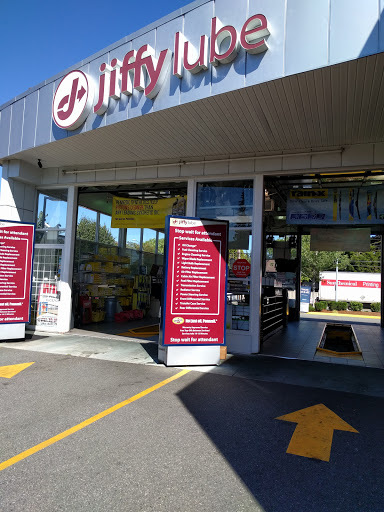 With that being said- I have to disagree with the below posts, because I find that Jiffy Lubes is not a "no-frills" outfit and does have some up-selling in terms of additional products that supplement your vehicles maintenance and performance. Optional, but they do have an upsell aspect to their business- which is fair enough. Overall- Ive had my battery changed here, Ive bought in to some of their upsell and optional products- but coming to an outfit such as Jiffy Lube does give me the peace of mind that I can trust my truck is being taken care of by a credible establishment. Super friendly service. Knowledgable staff. I can see why they won the Best of Richmond 2016 award for best place for an oil change. The owner is an honest, hard working, small town guy that you get to deal with directly. This is one place a guy can be comfortable sending his wife / girlfriend knowing they arent going to up-sell her with a bunch of stuff she doesnt need. As an added bonus they always have some sort of contest going on where you can win crazy prizes such as a free trip to Vegas or even a free car. I can say so many more good things about this place but you really have to experience the service yourself. Try it out. You wont be disappointed. I guarantee this will become your regular spot. These guys are honest, friendly, and very knowledgeable. They will not recommend any services you dont need like the countless other oil change places Ive been to over the past 3 years. I was told by another Richmond business (that has changed their name numerous times...) that I needed my power steering and brake fluid replaced. I went to Jiffy Lube and they told me that other than a few fluid top-ups, I didnt need any work done. Nav and his team are conducting business with honesty and integrity, and treat you like a VIP. For an oil change experience like no other in Richmond, I highly recommend visiting Jiffy Lube. These guys are awesome. I had a ton of oil leaking from my 2013 sante fe. I had my car serviced from the dealer a couple weeks before. I suspected the dealer didnt tighten the oil filter or drain plug well enough. Nav the owner personally inspected my car. He took pictures and showed me the actually problem was the oil pan gasket was leaking. Nav and his team topped up my oil free of charge. He didnt have to do that. I will definitely be bringing my car back to them the next time I have an issue. Great service, professional and efficient. Bring your car them. Fast oil changes with friendly staff. Some light pressure tactics, but they are fully willing to accept a "No thank you," which is much better than I can say for other quick oil change outfits. Better than reasonably priced oil change when you consider that the staff will both check and top up most fluids. An adjoining car wash where you can get a discounted mid-grade wash after your oil change is a great bonus. Ive been going to these guys for a couple years now and will continue to go there for the foreseeable future. I came here the other day because my car needed an oil change. One of the guys told me my filter needed to be changed and UNLIKE most lube places, he actually showed me the filter so I could see that it was dirty. He also asked me if I had done any service type things to my car myself or if anyone else has and what I would like done and if I was experiencing any problems. The price was also comparable to the previous place I used to go to. I will certainly be recommending them to friends and family. The experience i had at Jiffy Lube was exceptional! So I brought over a car battery i bought at Canadian Tires, which ended up to be the wrong size... The staff was kind enough to drive me back to Canadian Tires to have it replaced and back to the shop. Also the whole time that i waited, I was offered food & water more than once by the staff. Top notch customer experience. Great job to Tozy, Rick, Navis & the team. I couldnt thank them more enough!! I went for an oil change and accepted a fuel tank cleaner and Rad Flush as it was almost bone dry they claimed. I got home and realized something - they never asked me to open my fuel door! I looked at the bill and I was also charged for a new Rad Cap - I just had the Rad & Cap replaced in March! I also filled out a form to get 10% off the fuel - no discount was taken off. Watch these guys closely! Very happy with the quality of service I got at this location. Kind and knowledgable staff providing exceptionally fast services. I went in for the first time last week, and was kindly greeted by all the staff. They told me what needed to be done without offering nonsense additional services, and within 10mins I was done. Highly recommended! Dealt with Nav over the phone. Asked him why I should come to this location as opposed to other oil change companies. He gave me a great answer. I went right after, the whole process took about 10 minutes, and I got to sit inside my car the entire time. The reps there are trained well. Definitely recommended.